WASHINGTON (Reuters) - President Barack Obama met with Republican and Democratic leaders in Congress on Wednesday to try to break a deadlock that has shut down wide swaths of the federal government, but there was no breakthrough. After more than an hour of talks, House of Representatives Speaker John Boehner said Obama refused to negotiate, while House Democratic Leader Nancy Pelosi and Senate Democratic Leader Harry Reid accused Republicans of trying to hold the president hostage over Obamacare. Reid said Obama told Republicans "he will not stand" for their tactics. As hundreds of thousands of federal employees faced a second day without pay, leaders of the Republican-controlled House of Representatives and the Democratic-led Senate offered token concessions that were quickly dismissed by the other side. Obama, meanwhile, scaled back a long-planned trip to Asia. Republicans have tried to tie continued government funding to measures that would undercut Obama's signature healthcare law. Obama and his Democrats say that is a non-starter. "The president reiterated one more time that he will not negotiate," Boehner told reporters after the White House meeting. "All we're asking for here is a discussion and fairness for the American people under Obamacare." 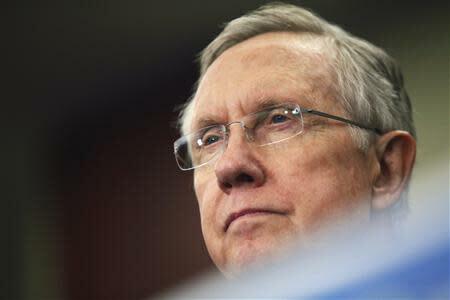 Reid said Democrats were willing to discuss any ways to tackle the budget after a temporary funding bill is passed. "We're through playing these little games," he said. The shutdown, which took effect Monday at midnight (0400 GMT Tuesday), has raised questions about Washington's ability to carry out its most essential duties. Though it would do relatively little damage to the world's largest economy in the short term, global markets could be roiled if Congress also fails to raise the debt limit before borrowing authority runs out in coming weeks. 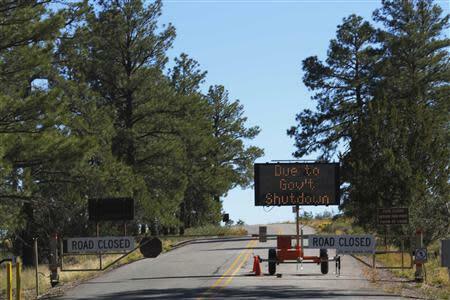 The shutdown has closed landmarks like the Grand Canyon and prevented some cancer patients from receiving cutting-edge treatment. United Technologies Corp, which makes Sikorsky helicopters and other items for the military, said it would be forced to furlough as many as 4,000 employees, if the U.S. government shutdown continues through next week, due to the absence of government quality inspectors. "Am I exasperated? Absolutely I'm exasperated. Because this is entirely unnecessary," Obama told CNBC television in an interview before meeting the congressional leaders. "I am exasperated with the idea that unless I say to 20 million people, 'You can't have health insurance,' these folks will not reopen the government. That is irresponsible." The U.S. Army's top general said the shutdown was significantly harming day-to-day operations, and intelligence leaders say it is undermining their ability to monitor threats. A Federal Reserve official said it could delay the central bank's ability to assess whether its monetary stimulus efforts are still needed. The uncertainty in Washington has forced the White House to scale back an Asia trip that was designed to reinforce U.S. commitment to the region. Obama scuttled two stops on a planned four-country tour and left visits to two other countries up in the air. He was due to leave on Saturday and return a week later. Secretary of State John Kerry will visit Malaysia and the Philippines in his place. Obama is weighing whether to attend diplomatic summits in Indonesia and Brunei, a White House official said. Despite the disruption, Boehner's Republicans have failed to derail Obama's controversial healthcare law, which passed a milestone on Tuesday when it began signing up uninsured Americans for subsidized health coverage. Though some moderate Republicans have begun to question their party's strategy, Boehner so far has kept them united behind a plan to offer a series of small bills that would re-open select parts of the government most visibly affected by the shutdown. The Republican-controlled House passed and sent to the Senate a funding bill that would re-open the National Institutes of Health, which conducts medical research, and another bill to reopen shuttered federal parks and museums, such as the Smithsonian museums, the National Gallery of Art and the Holocaust Memorial Museum in Washington. Both bills passed with the support of about two-dozen Democrats, who joined Republicans. The House was expected to vote Thursday on measures to fund veterans' care, the District of Colombia and the Army Reserve. The measures are likely to be defeated in the Democratic-controlled Senate, and Obama said he would veto them if they reached his desk. Still, they allowed Republicans to charge that their adversaries are standing in the way of help for elderly veterans and young cancer patients. "Will they now say 'no' to funding for veterans, our National Parks and the National Institutes of Health?" asked Boehner spokesman Michael Steel. Reid told Republicans he would engage in talks about tax reform, farm policy and other pressing issues that Congress has failed to address once Republicans agreed to re-open the government without conditions. Republicans dismissed that idea. A Reuters/Ipsos poll indicated that 24 percent of Americans blamed Republicans for the shutdown, while 19 percent blamed Obama or Democrats. Another 46 percent said everyone was to blame. The shutdown fight is rapidly merging with a higher-stakes battle over the government's borrowing power that is expected to come to a head soon. Treasury Secretary Jack Lew has said the United States will exhaust its borrowing authority no later than October 17. The government could have difficulty paying pension checks, interest charges and other bills after that point. Many Republicans see the debt limit vote as another opportunity to undercut Obama's healthcare law or extract other concessions - an approach that business groups say could lead to disaster. "You can re-litigate these policy issues in a political forum, but they shouldn't use the threat of causing the U.S. to fail on its ... obligations to repay on its debt as a cudgel," Goldman Sachs chief executive Lloyd Blankfein told reporters after he and other financial-industry executives met with Obama. Some Democrats have begun to consider asking Obama to unilaterally raise the debt ceiling on his own - a move that could lead to years of court battles. The White House has said that approach is not feasible. Asked whether there is a push underway among Democrats to convince Obama that he should use this power, a senior House Democrat who asked not to be identified said: "No, not at this point." Stock investors on Wednesday appeared to show growing anxiety over the standoff after taking the news in their stride on Tuesday. The S&P 500 and the Nasdaq both closed down 0.1 percent. Obama said Wall Street should be worried about the debt ceiling. "I think this time's different. I think they should be concerned," Obama told CNBC. "When you have a situation in which a faction is willing potentially to default on U.S. government obligations, then we are in trouble." A short-term shutdown would slow U.S. economic growth by about 0.2 percentage points, Goldman Sachs said on Wednesday, but a weeks-long disruption could weigh more heavily - 0.4 percentage points - as furloughed workers scale back personal spending. 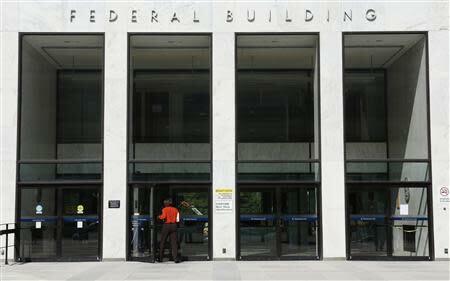 The last shutdown in 1995 and 1996 cost taxpayers $1.4 billion, according to congressional researchers.